eCite - Pharmaceutical opioid analgesic and heroin dependence: How do treatment-seeking clients differ in Australia? Introduction and Aims. Non-prescribed use of pharmaceutical opioid analgesics (POA) has been escalating internationally. In Australia, few studies have examined if POA users have similar characteristics and treatment needs to heroin users.The aim of this study was to compare those presenting for treatment where heroin versus POA were the primary drugs of concern. Design and Methods. A convenience sample of 192 treatment entrants were recruited from alcohol and drug treatment services in four Australian jurisdictions. A structured interview collected data on demographic characteristics, substance use, self-perceived mental and physical health, crime and harms resulting from drug use.Multivariate analyses were performed to identify characteristics which may differentiate those seeking treatment for heroin compared with POA. Results. Most treatment entrants sampled reported a history of injection drug use and use of both heroin and POA. However, those with primary POA problems were less likely to report an overdose history (adjusted odds ratio 0.90, 95% confidence interval 0.81�99) and more likely to initiate opioid use for pain (adjusted odds ratio 2.52,95% confidence interval 1.04�12) than those with primary heroin problems.Latent Class Analysis found that,while most of the POA group were similar to heroin users in demographics, health and injecting drug use, there was a small, distinct group of primary POA problem users that did not typically inject and who commonly initiated opioid use for pain and also experienced elevated physical and mental health disability. Discussion and Conclusions. 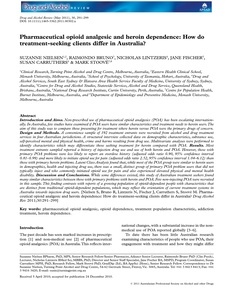 While some differences existed, this study of Australian treatment seekers found many similar characteristics between those with primary problems with heroin and POA.Few non-injecting POA were recruited in this sample.This finding contrasts with reports of a growing population of opioid-dependent people with characteristics that are distinct from traditional opioid-dependent populations, which may reflect the orientation of current treatment systems in Australia towards injection drug users. [Nielsen S, Bruno R, Lintzeris N, Fischer J, Carruthers S, Stoov� M. Pharmaceutical opioid analgesic and heroin dependence: How do treatment-seeking clients differ in Australia?